A funnel is a pipe with a wide, often conical mouth and a narrow stem. It is used to channel liquid or fine grained substances into containers with a small opening. Without a funnel, spillage would occur. Funnels are usually made of stainless steel, aluminium, glass, or plastic. The material used in its construction should be sturdy enough to withstand the weight of the substance being transferred, and it should not react with the substance. For this reason, stainless steel or glass are useful in transferring diesel, while plastic funnels are useful in the kitchen. 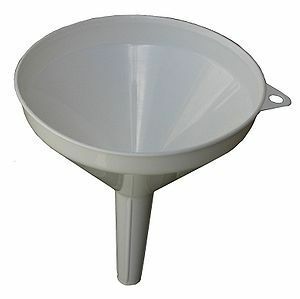 Sometimes disposable paper funnels are used in cases where it would be difficult to adequately clean the funnel afterward.